Fiat Chrysler's new headquarters will be in this St. James's Street building that also houses The Economist. MILAN (Bloomberg) -- Fiat Chrysler will locate its new global headquarters in London's West End, opting for the most expensive office district in the world. Fiat Chrysler Automobiles, the entity that will be created from Fiat's merger with U.S. unit Chrysler Group, agreed to lease three floors in a building on St James's Street that also houses The Economist magazine, Jonathan Stern, a partner at Mellersh & Harding, the property's broker, said. The new offices are about a 10-minute walk from Buckingham Palace, Queen Elizabeth II's official London residence, and close to Jermyn Street, famous for its shirt makers. Fiat Chrysler CEO Sergio Marchionne chose London for the new headquarters to represent the group's ambitions to become a global automotive power. The city is also neutral territory between the Italian carmaker's former home in Turin and Chrysler's historic association with Detroit. FCA, which will be the world's seventh-largest carmaker, plans to embark on a 55 billion euro ($71 billion) expansion plan to better compete with bigger rivals such as Volkswagen Group and General Motors. The merger is set to be finalized next month, with shares to start trading on the New York Stock Exchange on Oct. 13. Fiat, which was previously based in a villa adjacent to the company's former Lingotto factory, expects to have its first board meeting at the new offices in late October. London's West End is the most expensive office location in the world. At $277 a square foot, the area beats Hong Kong's Central district, broker CBRE Group Inc. said in June. 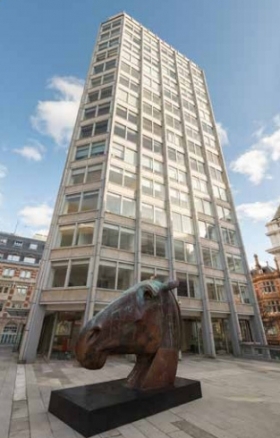 The vacancy rate for workspace in the West End is 3.5 percent, the lowest since December 2007, broker Savills Plc said this month. Fiat's decision to make London the site of its new headquarters sparked a residential buying spree in the city, according to Tom Bill, head of London residential research at Knight Frank LLP. Italians were the biggest group of foreigners to purchase homes in London's best districts from January through August, he said in a Sept. 8 report. Rents for prime office space in the Mayfair and St James's neighborhoods, which is where the building is located, run at more than 103 pounds ($168) a square foot, a 4 percent rise from the first quarter, according to the Savills report. CNH Industrial NV, the company formed by the combination of Fiat Industrial and its CNH unit, will also locate its headquarters in the space.